Calibanus hookeri can be used as an unusual specimen plant. 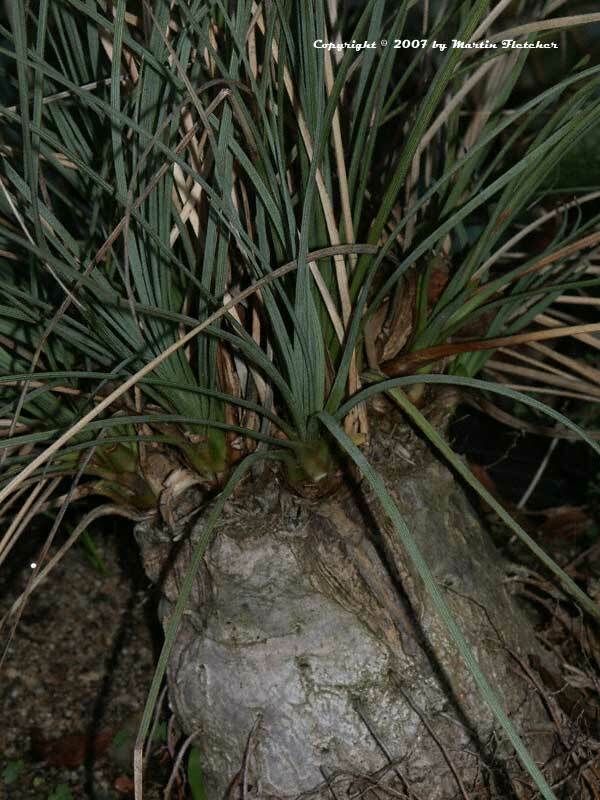 The large caudex root can be exposed to create an unusual focal point. Or it can be used much as any other grass would be used. Calibanus hookeri is native to the mountains of Northern Mexico. The Mexican Boulder is hardy when temperatures dip into the single digits. Calibanus hookeri flowers rarely, the male and female flowers appear on different plants. The flowers are insignificant and are buried in the foliage. Calibanus hookeri is related to the Agave and Dasylirion but is in the Nolinaceae with some other yucca relatives. Calibanus hookeri requires a low water section of the garden or very good drainage. Foliage and caudiciform base of Calibanus hookeri Mexican Boulder. High resolution photos are part of our garden image collection.